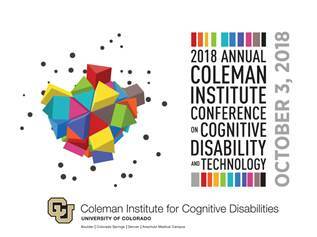 The Coleman Institute's 18th Annual Conference on Cognitive Disability and Technology, “Advancing Accessibility for All” will be held October 3, 2018 at the Omni Interlocken Hotel in Broomfield, CO – and representatives from Imagine! will be there to present on Imaginect. Jennifer Sheehy, Deputy Assistant Secretary of the Office of Disability Employment Policy (ODEP) and John L. Martin, the Director of the Ohio Department of Developmental Disabilities will serve as this year’s Coleman Conference keynote speakers. In addition, a variety of both local and national speakers addressing issues related to people with cognitive disabilities and their access to technology will present their work and research, including Imagine! CEO Mark Emery and PR Director Fred Hobbs, who will be presenting on Imaginect. In addition to our Imaginect presentation, attendees at the conference will be informed about “The Rights of People with Cognitive Disabilities to Technology and Information Access,” a statement of principles informally known as “The Declaration,” and currently endorsed by over 250 leading disability organizations across the nation will be presented and attendees will have an opportunity to join this national movement that works to ensure full inclusion of people with cognitive disabilities in our technology driven world. This conference is the only venue of its kind sharing contemporary knowledge of promising practices in cognitive disability and technology innovations and cultivating relationships between public and private entities.